Dale Earnhardt Jr. will be enshrined at Texas Motor Speedway. FORT WORTH, Texas – Dale Earnhardt Jr.’s historically unique connection to Texas Motor Speedway will be recognized next month as NASCAR’s perennial Most Popular Driver heads into retirement. Earnhardt Jr. will become the 19th member inducted into the Texas Motorsports Hall of Fame during ceremonies in The Grand Ballroom of The Speedway Club on Saturday, Nov. 4. The event, held in conjunction this year with the AAA Texas 500 NASCAR tripleheader playoff weekend, will begin at 11:30 a.m. (CDT). Other TMHOF honorees are NASCAR Vice Chairman Mike Helton; Kyle Busch, TMS’ winningest NASCAR driver and Verizon IndyCar Series regular James Hinchcliffe. Junior’s career forever became linked to TMS after the third generation star scored his first career NASCAR Xfinity and Monster Energy NASCAR Cup Series victories on the 1.5-mile oval. TMS hosted its first NASCAR race weekend in April 1997. Earnhardt Jr. earned his first career Xfinity Series win on April 4, 1998 in the Coca-Cola 300 in his 16th career start. Driving the No. 3 ACDelco Chevrolet, Junior took the lead from veteran Joe Nemechek on the final lap and held off pole-sitter Elliott Sadler to win by 0.178-seconds. Junior led only six of 200 laps; he led for the first time on Lap 181. Nearly two years to the day later, Junior won his first Cup Series race on April 2, 2000 in the DIRECTV 500. Earnhardt Jr., who started fourth, was the class of the field on a day in which he led 106 of 334 laps in his No. 8 Budweiser Chevrolet to become the first Cup rookie driver to win at Texas Motor Speedway. Junior finished a decisive 5.920-seconds ahead of runnerup Jeff Burton, who scored his first Cup win in the inaugural Cup race here in April 1997. The emotional Victory Lane celebration between Junior and his father/car-owner, seven-time Cup champion Dale Earnhardt, remains one of TMS’ iconic photographic moments. Junior shocked NASCAR Nation on April 25, when he announced his intention to retire after 18 seasons and more than 600 races behind the wheel. The decision aligned with the end of Earnhardt’s current contract with Hendrick Motorsports, set to expire at the end of 2017. A two-time Daytona 500 champion, Earnhardt has driven for team-owner Rick Hendrick since 2008 following an exit from Dale Earnhardt Inc.
Earnhardt, who turned 43 on Tuesday, made his first career Cup Series start on May 30, 1999 at Charlotte Motor Speedway in Concord, N.C. Since then, the Kannapolis, N.C., native has captured 26 points-paying Cup race wins and been voted by fans as NASCAR’s Most Popular Driver a record 14 consecutive years. He has qualified for the NASCAR playoffs eight times but failed to make the original 16-car bracket for this year’s postseason. Junior will compete in his final Cup race on Nov. 19 at Homestead-Miami Speedway. 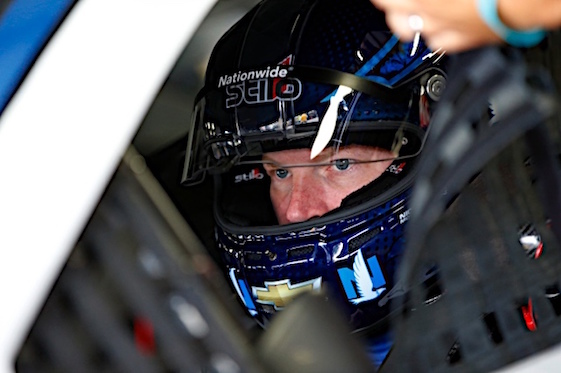 Dale Jr. missed the second half of the 2016 Cup season because of a concussion. It was at least the third documented concussion during his NASCAR career. Helton will receive the Bruton Smith Legend Award for his leadership as NASCAR President and shaping the sport during an unprecedented expansion period that began during the mid-1990s. Helton was instrumental in introducing NASCAR to new markets both nationally and internationally. New state-of-the-sport facilities in North Texas, Southern California, the Chicago market, and Kansas City were added to NASCAR’s schedule by 2001, moving the sport beyond its traditional Southern-based roots. Later, NASCAR’s presence grew with the addition of series in Mexico and Canada in 2007. Helton also was a key figure in the formation of the NASCAR Research & Development Center in Concord, N.C. Dedicated to strengthening NASCAR’s competition and safety initiatives, it is the first R&D center owned and operated by a sanctioning body of a major motorsports series. “Rowdy” Busch of Joe Gibbs Racing will be honored with the 2016 Racer of the Year award following another impressive overall performance at Texas Motor Speedway last season. For the second time in his career, Busch swept both the Cup and Xfinity series races in Cowtown during the same weekend, winning April’s Duck Commander 500 and the O’Reilly Auto Parts 300. Busch, driver of the No. 18 Interstate Batteries Toyota Camry, overcame an early pit road mishap to win the rain-delayed Duck Commander 500. Busch finished 3.904-seconds ahead of Dale Earnhardt Jr. Busch posted his seventh Cup win in 32 starts after returning from a compound fracture of his lower right leg and a broken left foot suffered in a crash during the 2015 season-opening Xfinity Series race at Daytona International Speedway. Busch rallied and went on to win the 2015 Cup championship. Busch won the O’Reilly Auto Parts 300 after leading a race-high 150 of 200 laps in his No. 18 NOS Energy Drink Toyota. The win was his fourth in the first five Xfinity races of the season, extending his series record to 80 victories. The twin wins were Busch’s 12th and 13th at TMS among NASCAR’s three national touring series _most by any driver. Native Canadian Hinchcliffe’s handling of a heartbreaking defeat in the rain-delayed 2016 Firestone 600 earned him the Texas Motor Speedway Sportsmanship Award. Graham Rahal of Rahal Letterman Lanigan Racing made a dramatic last-lap pass of Hinchcliffe’s Arrow Schmidt Peterson Motorsports Honda to win by 0.0080-seconds, capping an event dubbed “The Resumption.” Rahal hoisted the Foyt-Rutherford Trophy after the closest finish in TMS history and fifth-closest in Indy car history. Originally scheduled for Saturday night, June 11, the start and finish were separated by 76 days. A total of 71 of the scheduled 248 laps were run on Sunday, June 12, before INDYCAR suspended the race because of a second rain delay. The race resumed on Lap 72 on Aug. 27 with Hinchcliffe in the lead. Traditionally held in April, the TMHOF event has been added to November’s NASCAR playoff tripleheader weekend. The schedule features the Camping World Truck Series JAG Metals 350 Driving Hurricane Harvey Relief on Friday, Nov. 3; Xfinity Series O’Reilly Auto Parts 300 on Saturday, Nov. 4 and the Monster Energy NASCAR Cup Series AAA Texas 500 on Sunday, Nov. 5. Established in 2003 by TMS President Eddie Gossage, the TMHOF honors individuals with ties to the Lone Star State and “The Great American Speedway” founded by O. Bruton Smith, executive chairman of Speedway Motorsports, Inc. Honorees receive a pedestal highlighting their accomplishments housed in the Hall of Fame Atrium adjacent to The Speedway Club. A panel of local and regional journalists select the nominees and vote on the inductees. The current TMHOF roster: A.J. Foyt Jr. and Johnny Rutherford, 2003; Terry Labonte and Lee Shepherd, 2004; Kenny Bernstein and Jim Hall, 2005; Eddie Hill, 2006; Mark Martin and Jim McElreath, 2007; Bobby Labonte and Bruton Smith, 2008; Joe Gibbs, 2009; John Force, 2010; Lanny Edwards, 2011; Jack Roush, 2012; Roger Penske, 2013; Rick Hendrick, 2014 and Jeff Burton, 2015. The TMHOF ceremony is a major fund-raiser for Speedway Children’s Charities-Texas Chapter. Tickets appropriately are priced at $88 to reflect Dale Jr.’s No. 88 Hendrick Motorsports Chevrolet SS. Admission includes a barbeque lunch buffet. For more information or to purchase tickets, call Speedway Children’s Charities at (817) 215-8421 or visit www.scctexas.org.